At Laith Family Dentistry, our #1 goal is to help our patients avoid dental problems in the first place. To do this, we encourage twice yearly dental exams and cleanings in our office and twice daily brushing and flossing at home. But despite our best efforts and yours, there usually comes a time when everyone requires some type of restorative dentistry. At that point, you can depend on either Dr. Kadamani or Dr. to recommend a treatment plan that will restore your oral health in a timeframe and on a budget that is right for you. Probably the restorative treatment that is most frequently performed at Laith Family Dentistry is a filling. A dental filling is necessary to repair a tooth with a cavity, or dental caries. A cavity develops when the bacteria that naturally live in the human mouth feed on sugars in the foods we eat. As these bacteria feast, they produce acids that over time erode a tooth’s enamel and create a hole. That hole is a cavity. Dr. Kadamani and use composite resin fillings to treat a cavity. Resin fillings, also known as tooth-colored fillings, can be blended to perfectly match the existing color of your tooth. Another advantage is that resin fillings require less removal of a tooth’s original structure, which mean the end result is a stronger tooth. Moreover, composite resin chemically bonds to your tooth for greater strength and durability. For a patient with a tooth that is severely decayed, cracked or broken, a dental crown may be the best treatment option. A crown, also called a cap, entirely covers a damaged tooth in order to protect and strengthen the tooth. To make sure a crown fits seamlessly alongside your other teeth, the damaged tooth will need to be reshaped and reduced in size. Once this is completed, we’ll take an impression of the tooth that our dental lab will use to manufacture your perfectly fitting crown. We’ll fabricate a temporary in our office for you to wear during the two weeks the lab spends making your permanent crown. At your next visit, the temporary will be removed and your new permanent crown will be cemented into place. No matter why a patient has missing teeth, tooth replacement is critical for oral health as well as general health. A person with missing teeth may feel extremely self-conscious about smiling or speaking. Moreover, even one missing tooth can compromise your ability to eat a varied and healthy diet. A dental bridge as the name suggests is an oral prosthesis that bridges the gap of one or more missing teeth. The false tooth, or pontic, that replaces your missing tooth is attached to crowns that are mounted on healthy adjacent teeth. 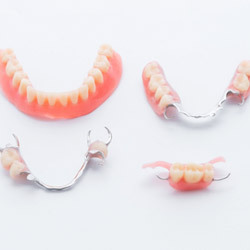 For patients who are fully edentulous, meaning they are missing all of their teeth along one or both arches, Laith Family Dentistry can create lifelike dentures that fit snuggly and comfortably. We offer full and partial dentures, as well as dental implant supported dentures for a greater sense of security and permanence. Implementing this simple Isolation Technique improves the dental experience for our dentists, our team, and our patients by making dental isolation easy. It increases office efficiencies by shortening chair time, as well as in patient outcomes and procedural safety. It works dependably and repetitively for consistent clinical outcomes every time. The key to our technology is the Isolation Mouthpiece, which allows dentists to achieve total control of the oral environment. It is estimated 120 million Americans are missing at least one tooth while another 35 million do not have any remaining. If you are among those who are missing several or all your teeth, we can complete your smile with partials or dentures in San Antonio. 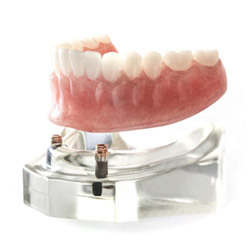 Partials feature prosthetic custom-made teeth that match the appearance of your natural ones. They are attached to a gum-colored base that has a metal framework which allows it to clip or clasp onto your remaining teeth. Dentures can replace an entire arch. An impression of your mouth is taken to create a base that is held in place using suction or an adhesive. Although they have a bad reputation for looking fake, we use the latest advancements in dentistry to promote a natural-looking appearance and a comfortable fit. As an alternative to traditional tooth replacement treatments, you can enjoy the security of dental implants in Central San Antonio. Titanium implant posts are surgically placed into your jawbone to act as new tooth roots. This helps to preserve your bone density while also giving you a secure foundation for your restorations. With over a 95% success rate, you can enjoy a solution that closely looks and feels like your natural teeth when choosing dental implants in San Antonio. We will create the treatment plan you need to invest in your quality of life and your oral health. If you’re ready to restore your healthy smile, call Laith Family Dentistry. Our San Antonio dental team is happy to serve the needs of children and adults through comprehensive general, cosmetic, and restorative care.